If you're headed to a cocktail party and want to dress simply but still have some fun pieces this jewelry is a great option. Check out the outfit I put together, the black dress is the base and then I accessorized with the amazing jewelry! I decided to layer some bracelets since that's what the cool kids are doing these days and opted not to add a necklace or ring. Even mixing metals is cool now, so go wild! I was compensated for this post, but my opinions are my own. Oh my word! the jewelery is GORGEOUS! I cant just pick one! And I have to say its priced pretty well. Ohh the first item is awesome..so soft and cool!love jewels:)have a nice day! The bouquet ring is so cute! That's definitely something I would wear! Pretty pretty very pretty... Dolce Bouquet Ring! I heart it! These are beautiful pieces, my mom's bday is coming up next month and pretty sure she'd love the first pendant is gorgeous! All of these pieces are so gorgeous! And I love the look that you put together - it's so chic. NBC as in NBC network? ha ha I love the rings! Those are cute! I like 2, 3 and 6 for the rings. Haha.New follower. Hope you follow back. I'm IN. LOVE. with the first piece!!! It is GORGEOUS!!! I love this post! I'm such a fan of thin bracelets and the ones you chose are beautiful! Love # 4 in the first one! Beasutiful jewelry! I love ring numer 6! The flower ring is awesome! Why are shiny things so attractive...? So I think I will take every piece you have here! Love!! Nice Jewelry! You picked all the gorgeous accesories! I love the ring number 6 above. 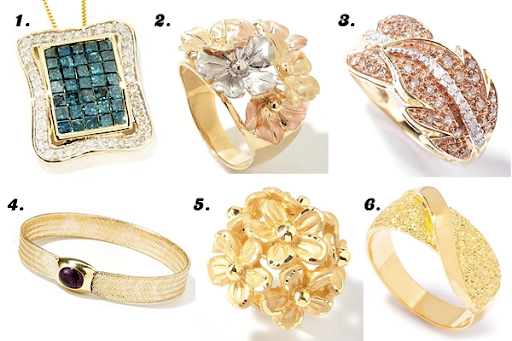 My favorite is the tri-color floral ring! You did such a good job Megan!